Sometimes there are big pieces of software that does a lot of things, but for a simple taks, it's useless. This tiny app is the opposite. You might wonder, why a simple app like this is even worth the mention. It's because it has one single purpose, for something a lot of web-savvy people fighting with on a daily basis. That's time-conversion. If you had to deal with that before, you know it's a pain. Sure Google helps, but if you're on your way there should be a more simple way. No data connection needed (well sort of). You can specify a time-zone and the time. Then you select the destination time-zone and press the convert button. And you see the time in the time-zone you chose. That's it. As a little bonus, you can select to see GMT in the settings with every conversion. This is ver handy. Yeah GMT (a.k.a UTC) is the world-time. That's the time we all should use in the internet as a basis. And not only in the net. You see some little things in the screenshot, that needs to get fixed. On the Galaxy Tab it scales, which is great. But something's wrong with the drop-boxes. It's a layout problem. And the ads are a little annoying on the top. I don't o a full review for a simple app like this, but it's a tool you don't want to miss, if you have to deal with different time-zones. I hope some UI-related things get fixed soon. 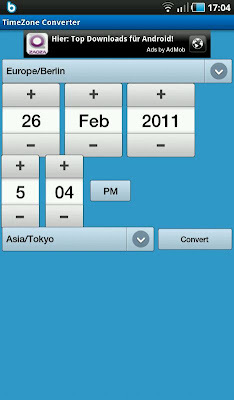 You can find it in the Android market: Time Zone Converter.